Nathan is a hydration company on the move this year, with products and lines superseding everything they’ve previously released by leaps and bounds. In the past, I was never really impressed their packs, and I have owned plenty. 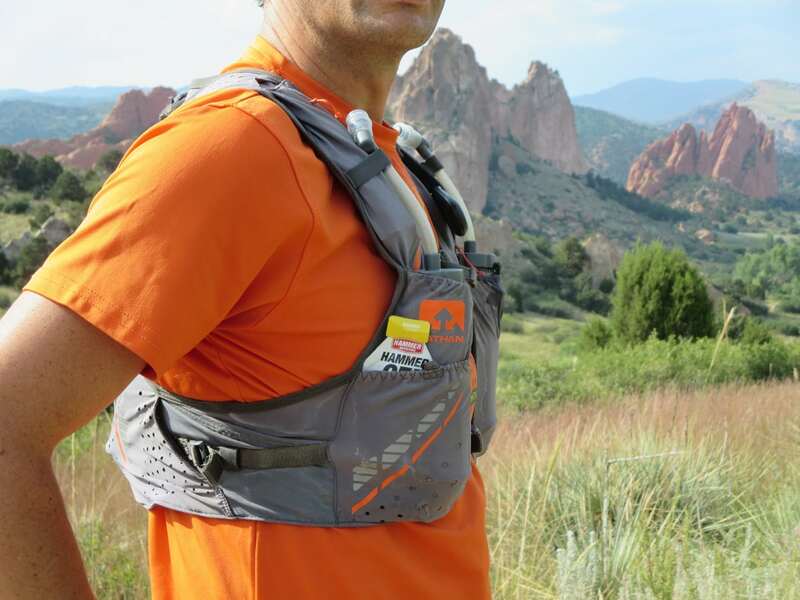 My very first ultramarathon was completed wearing the original HPL #020 Hydration Vest, which is still very popular. However, while other companies, namely Salomon and Ultimate Direction, made huge developments every year in pack design, materials, and fit, Nathan’s packs seemed to stagnate. While packs such as the VaporAir and Fireball were certainly durable and well made, they just seemed clunky and heavy next to the body-hugging state-of-the-art packs made by other brands over the last few years. 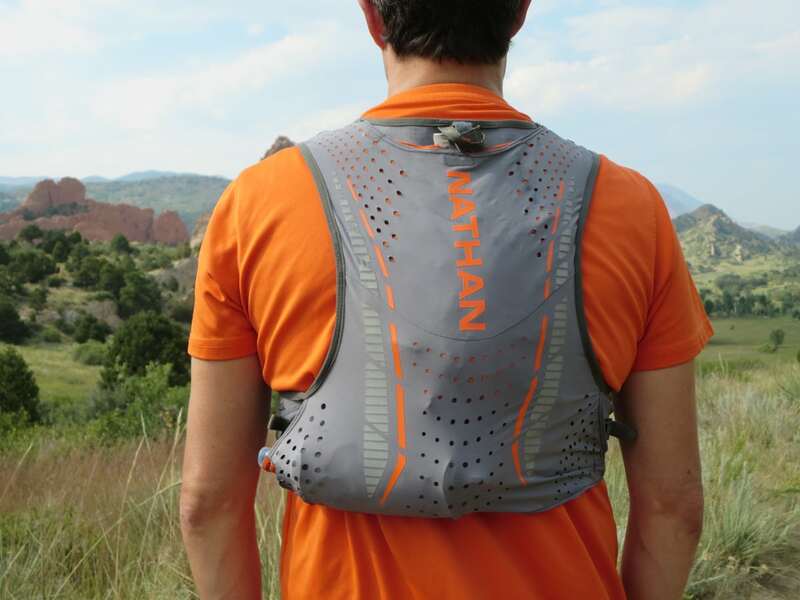 That has all changed now, though, and the Nathan VaporKrar 4L Race Vest ($150) is my pick for pack of the year. While I’m sure that input from the man, Rob Krar, was very helpful in the design of the vest, the entire line looks and feels amazing. While I tested the four-liter version, a 12-liter vest is also available, the Nathan VaporKrar 12L Race Vest. Also in Nathan’s latest generation of packs are those in the VaporHowe line (with design input from Stephanie Howe Violett) and the soon-to-be released VaporZach line (of Zach Miller fame). The materials are second to none and all these packs check all the right boxes with being lightweight, durable, sized well, and with lots of storage options. 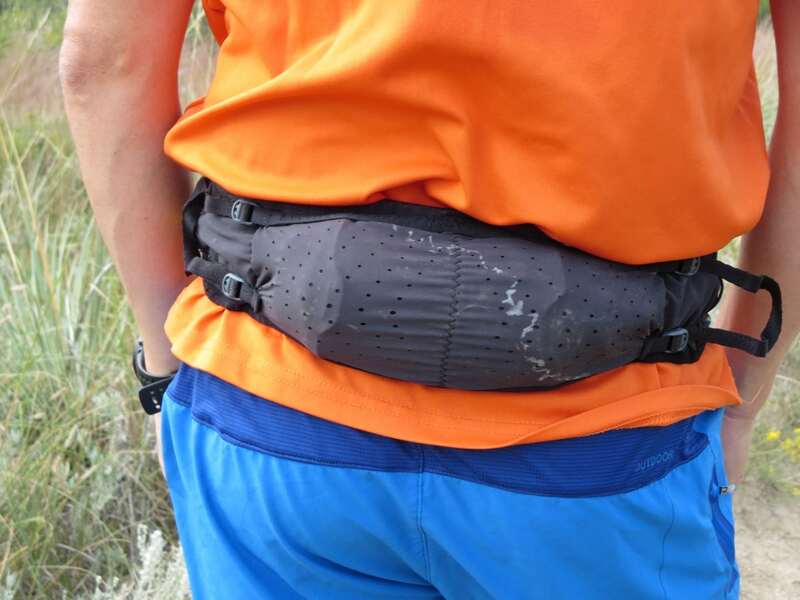 Also included in this article is a review of the Nathan VaporKrar WaistPack ($60), which stands as the only waist pack I’ve ever liked. Enough said. Four liters of storage doesn’t seem like a lot, but I found this pack to have more than efficient storage during the entire 2017 Bighorn Trail Run 100 Mile, during which I carried a lot of extra clothes and a backup headlamp all in the stretchy and cavernous back pocket. While Nathan does outfit this pack to accept up to a 1.8-liter bladder, I haven’t given it a try. At first I was concerned that the two included Exoshot 12-ounce soft flasks wouldn’t provide enough hydration, but I loved the ease of drinking on the run through the extended straw tubes. I ultimately used a separate Nathan 18-ounce soft flask in the lumbar pocket, which offered me 42 ounces total and I was able to put different fluids in different flasks. This tactic also seemed to be a well-balanced load and I experienced absolutely zero bouncing. The two zippered shoulder pockets were large enough to hold my iPhone 6 and five gels at a time. Additional nutrition can be stored in the dump pockets right below the soft-flask holsters on the chest, and I appreciated that a velcro tab keeps everything secure. I found it much harder to use the side pockets that run along the ribcage due to the adjustment straps that essentially run over them. I would gamble on putting a gel in each pocket, but they never felt that secure to me. A back view of the Nathan VaporKrar 4L Race Vest. The most remarkable aspect of the VaporKrar is the fit and I was lucky enough to have several sizes in stock at my local specialty-running store to dial things in. Luckily, Nathan’s sizing recommendations are pretty spot on, and the size medium worked well with my 38-inch chest. The materials on their vest are soft and extremely stretchy, very similar to what Salomon has been using in their vests. Where Nathan diverges is through the use of a more rigid piping where the sternum straps attach. This gives the vest a bit more of a secure fit and structure as the wearer is able to slide the sternum straps up and down to avoid discomfort and really dial things in. This feature is oddly reminiscent of the Salomon Advanced Skin packs from several years ago, and it works great. 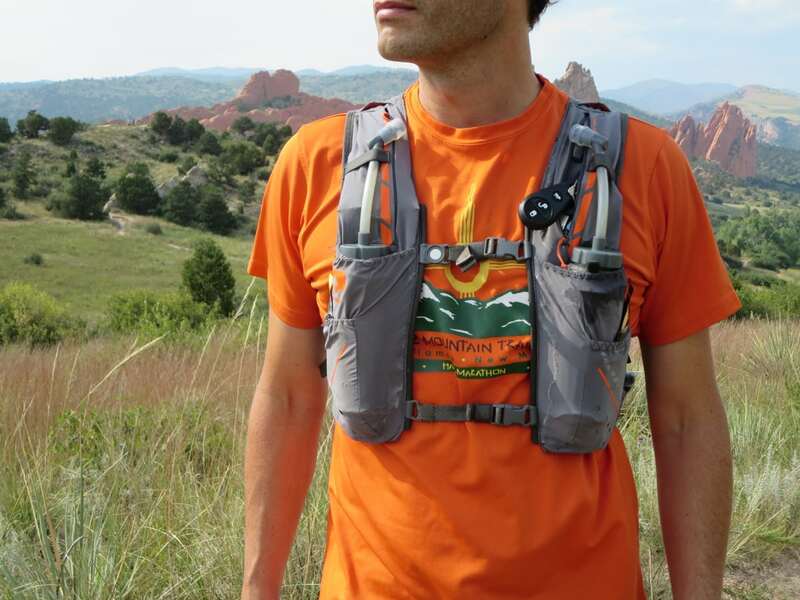 While I don’t usually like side straps for fear that they will dig into my ribcage, the adjustable-on-the-fly side straps on the VaporKrar 4L Race Vest stay put and are very easily loosened or tightened as needed, depending on the load you’re carrying. The only disappointment I have with this pack is that the side straps do make it very difficult to access the side compartments, but frankly I didn’t miss them in this race-oriented pack. I did have some issues with sore spots, more like early bruising rather than rubbing, around my lower ribs, where the soft flasks terminate when fully inserted. I found this was due to construction of the flasks rather than the vests, and it was important for me to make sure that the plastic spine of the Nathan soft flask pointed out rather than riding against my chest. A side view of the VaporKrar VaporKrar 4L Race Vest. I hate waist packs. I have tried over half a dozen, and every time I come away with hot spots or a sore lumbar region. With the unfortunate combination of narrow hips and some dadbod paunch if I’m not careful, waist packs have never been my friend. Enter the VaporKrar Waistpak with its soft, stretchy, one-piece construction complimented by fully adjustable side straps that can be dialed in for a no-bounce experience. The VaporKrar Waistpak has a zippered pocket up front which will accommodate an iPhone 7 Plus as well as several pockets with various closures into which you can shove a ton of nutrition. A back view of the Nathan VaporKrar WaistPak. 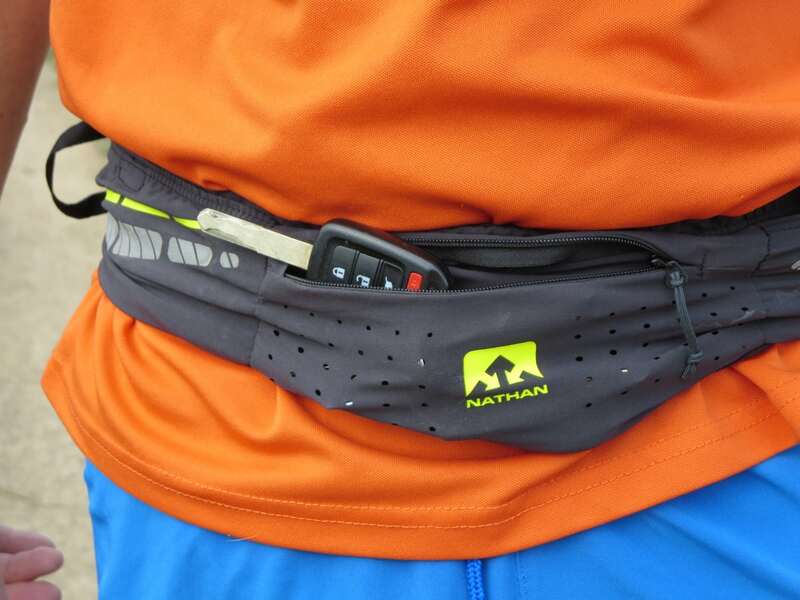 The back of the belt features a large lumbar pocket designed to hold a soft flask, and Nathan includes their 18-ounce soft flask with the belt. 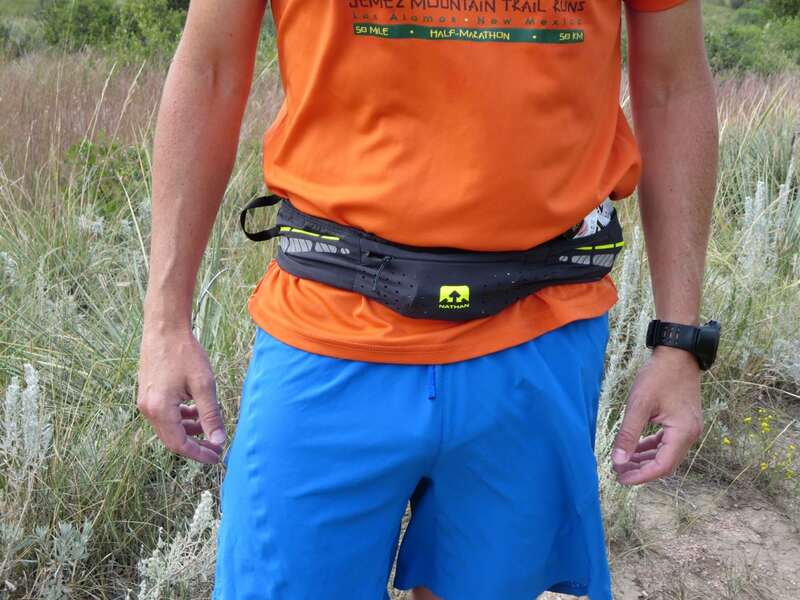 It did take a bit of practice learning how to put the soft flask back in on the run, but I liked the freedom of using this belt rather than a pack, especially on hot days when I didn’t want the extra layer of a pack. An added bonus is that this waist belt can be adjusted to be worn higher over a shirt or lower at the hips on top of running shorts. This allowed me to avoid hotspots on longer runs which were entirely caused by the hard internal spine of the Nathan soft flasks. When used with a spineless soft flask, I never had any issues. The back pocket of the Nathan VaporKrar WaistPak, containing an 18-ounce soft flask. A pocket on the Nathan VaporKrar WaistPak with a velcro closure. A zippered pocket on the Nathan VaporKrar WaistPak. Nathan is on the cutting edge of hydration systems currently, and after looking at their fall catalog, I don’t think they’ll be slowing down anytime soon. Both of these products have been incredibly durable this spring and summer, and they are both very lightweight with the VaporKrar 4L Race Vest weighing in at 6.4 ounces without flasks, and the VaporKrar WaistPak weighing a featherweight 2.1 ounces unloaded. Comparably, the Salomon S-Lab Sense Ultra 5 Set weighs in at around 4 ounces, but it bounces a bit more and feels less durable than the VaporKrar. While having straws on bottles is nothing new, I really liked the ease of drinking out of straws on the Exoshot 12-ounce soft flasks. However, my biggest gripe with the VaporKrar products has nothing to do with the vest or the belt, but rather the construction of the soft flasks that originally shipped with the packs. I found it very difficult for both myself and race volunteers to get the tops on without any leakage. Essentially, I had to learn to gingerly handle these flasks as to not compress the top opening in any way while putting the cap on. Additionally, while I like the idea of some rigidity in a soft flask, the internal plastic spine is overkill and just creates hotspots if you aren’t careful when using them in both the vest and the waist pack. But I have some good news, Nathan has recently updated the caps on the Exoshot flasks to have a bit more threading. 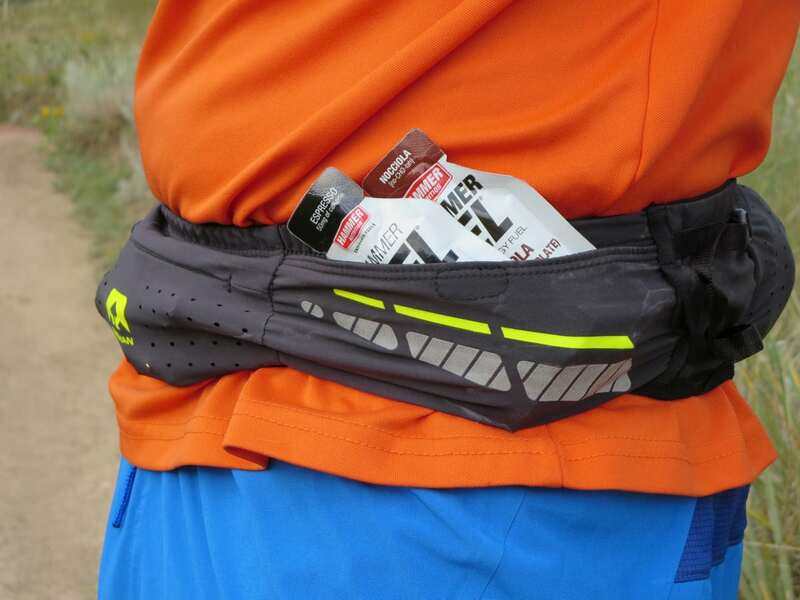 All current VaporKrar 4L Race Vests ship with the updated flasks. The result is a completely leak-free flask that is easy to fill and cap. If your flasks have grey tops, then you have the original version. If your flasks have black tops, then you have the updated flasks. A big thank you to Rob Krar, who I ran into while pacing Run Rabbit Run 100 Mile, for investing his time to make sure that Nathan sent me the updated flasks. If you’ve been searching for the perfect vest or waist pack, I would highly recommend checking these VaporKrar products out. I purchased them both in the midst of a gear panic prior to this year’s ‘A race,’ and I was pleasantly surprised by their form, fit, and function. It may take a while for any other product to unseat them as my favorites. Of course, they can also be worn in combo to provide a ton of storage options for longer days on the trail. Have you been running in any of the packs in the Nathan VaporKrar line? What are your overall impressions of the products you are using? What are your thoughts on the storage capacity and pocket options of the Nathan VaporKrar 4L Race Vest and/or the Nathan VaporKrar WaistPak? And how about the fit and ride of either this vest or waist pack? I’ve got the 12L VaporKrar and absolutely love the pack. Over summer I’ve used a bladder and soft flasks with straws (UD flasks with the caps & straws from Hydrapak Ultra flasks seem to work best.). Dialling the fit as the bladder draws down is a simple as giving the side straps a quick tug. As the 12L doesn’t have the side pockets you don’t need to worry about mashing their contents into your ribcage. Unfortunately it’s not all beer and skittles. For some inexplicable reason Nathan chose to use a very soft webbing for all the straps and it’s not holding up well. At some point in the near future I’ll need to find someone to replace the side straps, and the the chest straps will probably need doing shortly after. How does it compare to the Raidlight Responsiv vest? I’m curious as you’ve tried both. This Nathan pack looks really nice but I worry about durability. The Raidlight vest is bombproof but a bit heavier than this vest. Thanks for the review. Great question! I love both vests. The Raidlight is awesome but I have had some trouble with how high it rides, almost on my neck, rather than my shoulders where the Nathan pack sits. I also like having a dedicated phone pocket and the stretchier material of the Nathan to stuff gear in. Both packs really don’t bounce, so they’re both great choices. Plus, with the Raidlight you get larger flasks but one of mine sprung a leak this past spring. You bring up excellent points about the durability. I’ve put the Nathan pack through Bighorn where I spent a lot of time falling in the mud. I think it is pretty darn durable. But, it doesn’t have the water repellent fabric on the back pocket of the Raidlight. I would try before you buy as you already have a great vest. It does sit high on the neck but I’ve found if I use a 1.8 litre bladder and have it packed it fits perfect. Plus I love the pole holders on the front, they are the simplest yet most effective way to hold poles for easy access that I’ve seen on a race vest and there is absolutely no bounce. I’ll be checking out the Nathan packs just because they seem very nice. Thanks for replying. I totally love the 4L pack, It’s been my go to now for anything over the 2 hour range. I’ll second the author’s complaint about the OG flasks/straws, and add that if your a skinny/tall dude the straws may be a liiiitle shorter than you’d like (some awkward neck craning to drink on the run). Great to hear that they’ve updated them though, I did my own aftermarket update to larger hydrapack bottles as well and have been pleased with the versatility that the vest offers. I’ve used it from everything to running into work (phone wallet keys change of clothes) to true “all day” training runs (1k calories, 2L of water between flasks/bladder, rain jacket) and it performs amazingly in both. Very interested to see what Nathan comes out with next. I’m totally sold on the WaistPak as well – I’ve run up to 44km with it carrying phone, keys, gels, soft flask and a light jacket with minimal bounce. A bonus for me is that it’s versatile enough to carry full manadatory gear for fell races as well: waterproof jacket in the back, waterproof trousers up front, hat and gloves in the side pockets. My only issue with it has been with the threading on the mouth of the supplied soft flask. It takes a couple of goes each time to get it right. Nathan updated the flasks as I noted in my review. The new flask tops are bomber, and I’d call Nathan’s customer service if I were you. Thanks Tom. I’m on to them now. Great review. I tried the 12L Vaporhowe but it was made very small. In fact, I find that all of their sizing has shrunk over the past 2 years. In 2015, I had the S/M VaporAiress- loved it!!!!!! I recently purchased the VaporAiress in L/XL because the S/M didn’t fit – and it’s almost too tight. I found the Vaporhowe extremely tight and I tried the XL on! I couldn’t take a full breath because it constricted my rib cage. If it didn’t have the adjustment straps on either side and/or there was more strap for chest adjustment, I could have made it work. I understand it’s supposed to fit like a shirt but the sizing is way too small and it completely misses an entire demographic of female runners – those who have a larger chest or are size 10+… Also, living in the PNW it rains a lot. Not sure how the fabric holds up to rain. Would everything get super saturated?? I love Nathan products just upset with the sizing these last couple of years. I have the waist pack and the 12L. I have found both to be made in a durable manner. No problems with fading, stitching, fraying, etc. My minor problem is the small horizontal tab of Velcro used to close WaistPak. I have a difficult time lining both sides up adequately while I am on the go. On the WaistPak the lower side of the pocket always seem to fold over/under each other, or shift laterally apart. In either case, if I am depending on the Velcro for a snug closure, I usually give up trying and just hope the depth of the pocket itself will be adequate. Also securing the soft flask in the rear pouch can be a trial/error event too. I have learned to absolutely never touch the valve stem when situating the flask (to avoid leakage). Also going with a compromise of having the flask partially out of the pouch and canted upward works OK too. I have put maybe 800 miles on my Krar Vapor 4l this year and mostly agree with the review (I like the pack) except on one point: the included flasks work in so for as they carry well up front, don’t bounce and are easy to drink from. My beef: I have a hell of a time putting the lids back on. It seems like it takes me six or eight attemps before the threads line up properly. Each attempt a bit more fluid (and time) is lost and, if it’s anything other than water, I get sticky hands. I definitely wouldn’t use the flasks if I was worried about time. Disclosure: I own an outdoor specialty store and we are Nathan dealers. See above. Nathan redesigned the lids and threading on these flasks. I had the old lids and recently received new flasks from Nathan. I’d call their customer service as the new flask lids are great. Shopping for a pack and I’m between the Krar 4L and the Salomon S Lab 8L. Anyone had experiences with both of those packs? Leaning towards the S Lab but worried about its durability. Both great vests. I lean towards the Krar, but the Salomon 8L has more storage and I love the side pockets on the vest. Salomon’s flasks do have more capacity than the VaporKrar as well. For me, it came down to fit, and the VaporKrar doesn’t bounce at all on me. I have friends that say the same about the Salomon 8L. Try both if you can. Of the two, the Krar wins. Front closure system (buckles), hydration pocket width/depth accessibility, fit and durability all nod to the Krar. Somewhat related question . . . does anybody have experience with the latest UltraSpire vests? I’ve had an Alpha for a number of years – which I’ve loved – but it’s showing its age (bungee cord splitting, back mesh tearing), so I’m thinking about getting a new one. Thanks! I really like it, but I believe it has been usurped by the materials and fit of new vests this year. 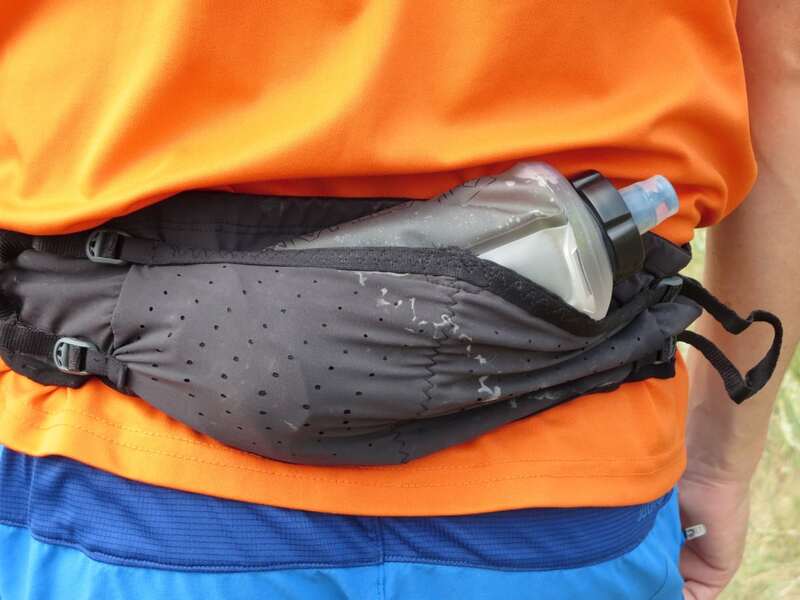 Do you have any thoughts on the VaporKrar WaistPak versus the Naked Running Band? I happen to have both, and the waistpak absolutely blows the naked band out of the water. I found the Naked band to be useful for small items, keys and phone, but felt like it was pretty hot to wear and it really dwarfs the midsection. While wearing the WaistPak I hardly notice it is there, and the ability to adjust on the fly and carry some water if needed means that my Naked band lives in the closet. I agree. The Naked band was way too constricting and uncomfortable for me. I ended up returning it. I actually bought the Vaporkrar band based on Tom’s review and tested it out on a 20-miler. Love it. It’s incredibly light, and you really do forget about it once you start running. I just wish I had purchased it earlier in the summer. For all other inquiries, go to our NATHAN contacts page. Appreciate all of your gear reviews, esp this one for the Waist Pack, since I share your disdain for those already available. Looking forward to trying out the VaporKrar WP. Also, what running shorts were you wearing? I noticed the zipper on what appears to be a vertical, right side pocket. Thanks for the kind words. The shorts are from Outdoor Research (Amplitude Short), and I’ve grown to like them despite them being longer than what I typically wear. I do like the vertical zip pocket, but things do bounce around in there as the shorts are featherweight. Hi. I an interested in the krar 4l capacity. How much can you stuff in it without it becoming uncomfertable? Will ut hold extra nutrition, windproof colothes, a headlight and other stuff you need for a 50 mile race without support?